The U.S has installed wind capacity of 82 gigawatts, 361 percent more than had been hoped for. Image: REUTERS/Antara Foto/Widodo S. Jusuf. In a February 2007 report, the United States Department of Energy made thirty year predictions for the country's energy usage and production. 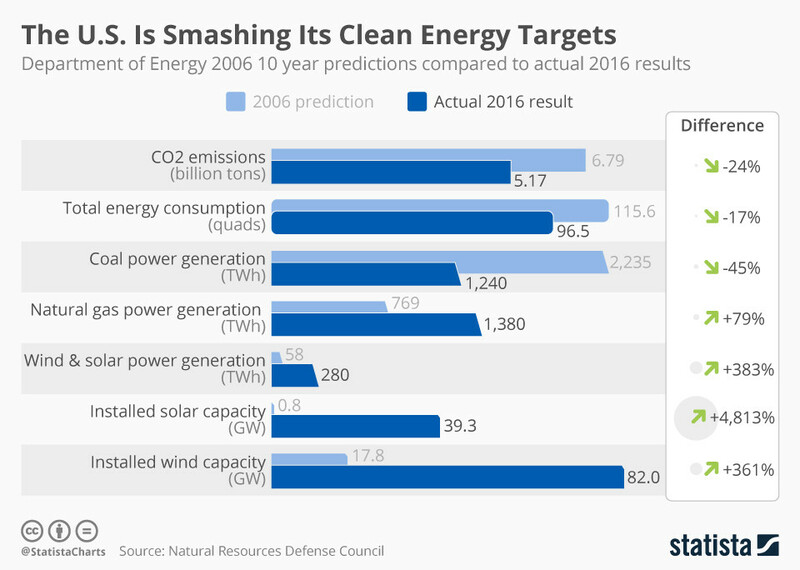 As our infographic shows, using data from the non-profit international environmental pressure group Natural Resources Defense Council, these forecasts have so far been smashed. Actual CO2 emissions in 2016 have undercut the 2006 predictions by 24 percent. In fact, energy consumption in total was also 17 lower than expected. In terms of the energy mix, power generated from coal was 45 percent beneath the forecast while clean(er) alternatives natural gas and wind/solar power saw overshoots of 79 and 383 percent, respectively. This article is published in collaboration with Statista.